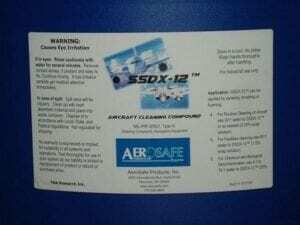 SSDX-12 is the newest and most effective aviation detergent on the market today. With its extraordinary cleaning power, you are sure to be impressed. The research behind this product was funded by the US Government. SSDX-12 is non-hazardous with a pH of 7.0 – 7.8 for exceptional user acceptance. SSDX-12 has no shipping restrictions and is non-corrosive. This product is absolutely safe to store and safe to use. 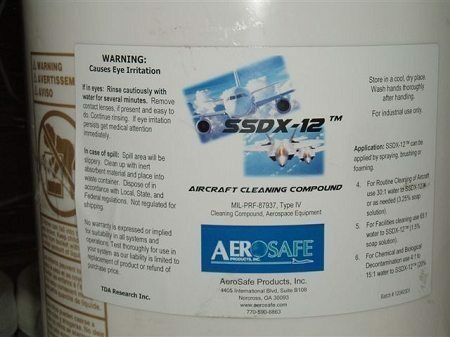 In addition to its exceptional aircraft external cleaning qualities, SSDX-12 is an excellent facility cleaner. These include but are not limited to the following: hangars, maintenance bays, hallways, floors, etc. This product has also performed outstandingly at Hill AFB during the cleaning of their industrial waste-water treatment facility. Due to its high efficacy and its 30:1 recommended dilution ratio, SSDX-12 is among the most cost-effective aviation detergents available. 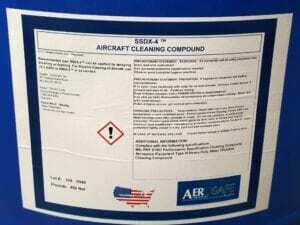 This product has been thoroughly tested and has met all the requirements for aircraft washing of Boeing (D6-17487) and AirBus (AIMS 09-00-02). It also has the following Mil-Spec: Mil Prf 87937 Type IV.